Is this town big enough for both Boban Marjanović and Gritty? We're about to find out! I don’t know who made a proverbial deal with the devil, and I don’t care to find out. Regardless of who it was, the fact remains that Philadelphia is now home to two cult-status heroes, and for that and that alone, the deal was worth it. I’m talking, of course, about Gritty and Boban Marjanović, arguably (with all due respect to Tobias Harris) the best part of the Sixers’ big trade earlier this week with the Los Angeles Clippers. 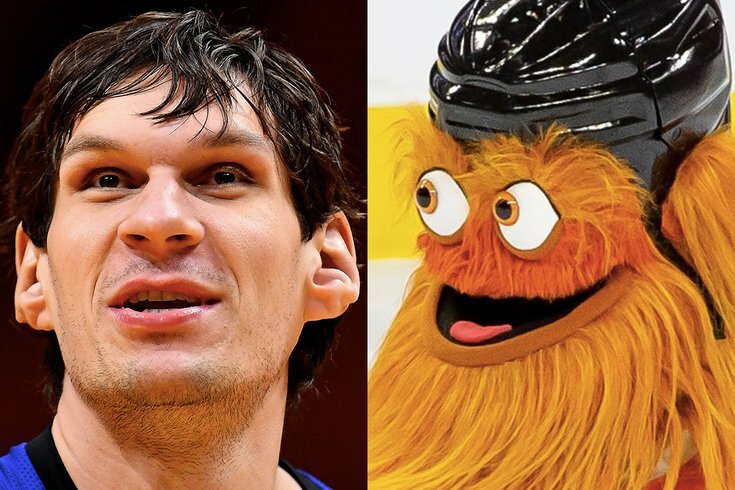 Like Gritty, Boban is a force of nature, a larger-than-life entity who brings smiles to the faces of those on his side and instills the fear of reckoning in foes’ hearts. He’s also a curiosity that – in one memorable moment – seemed to bewilder the unflappable Joel Embiid in their first human encounter. Get ready for this town to embrace Boban as best regularly sized humans can embrace gargantuan beings who walk among them. In anticipation of the first time Boban steps on the court as a Sixer, we here at PhillyVoice have decided to work up a Tale of the Tape of sorts. No, they’re not getting in the ring for a charity boxing event of any sort – THOUGH THEY TOTALLY SHOULD – but it’s nice to know just how Gritty and Boban stack up against one another. Let's take a look at how they stack up in 16 different categories, shall we? Boban: Married to Milica Krstic with two children, Vuk and Pera. Gritty: All that’s been made public is that his father was a “bully,” no significant other or children that we know of. Boban: NBA play notwithstanding, it was arguably when he helped lead the Serbian side to gold at the FIBA U19 World Championship over an American side featuring, among others, Steph Curry. Gritty: The half-court shot at Rutgers heard ‘round the basketball and mascot worlds. Boban: In the U.S., he enjoys steak. (Eagerly anticipating the gimmicky TV shots of Boban choosing between Pat's and Geno's, if only to see how many cheesesteaks Boban can house in one sitting.) In Serbia, he prefers his grandma’s cooking. Gritty: Hot dogs and snow straight from the Zamboni. Boban: Tennis player Novak Djokovic. Gritty: Flyers captain Claude Giroux. Boban: A puffy yellow vest without an undershirt. Boban: Smooth, per this Ben Simmons Instagram video. Boban: What was then his career high of 18 points in his rookie season with the Spurs against none other than his new team, the Sixers. Gritty: A debut at the Franklin Institute that sparked a mass reaction that evolved from nightmare fuel to beloved Philadelphia mascot in the course of hours. Boban: Proportional (for a giant) ears and size 20 feet, which became a problem when he tried to go to a SoulCycle last year. Gritty: A purple belly button. Gritty: There have been countless appearances. For pure reach, though, showing up at Stephen Colbert’s Super Bowl Party exposed more people to the glory that is Gritty. Boban: A barely-jumped, one-handed dunk against the Wizards last October. Gritty: Lassoed a Penguins fan with an electrical cord on Capitol Hill. Boban: In 2018, he tried to learn surfing lingo and interviewed a dog and a baby. Boban Marjanovic went to the @WSL Surf Ranch Founders Cup and interviewed Kelly Slater. Gritty: Only speaks through a translator. More of a prop comic, a la Gallagher, and belly roller like the Phanatic. Boban: "He should apologize to his team tomorrow for being so greedy. He just wanted to get his name in the paper." – a sarcastic Spurs coach Gregg Popovich after Boban dropped 19 points in 14 minutes against the Miami Heat.